Vancouver artist Tony Max is a renaissance man of the arts. He has crafted a living through a lifetime of artistic endeavours, including writing, graphic design and painting. In fact, Max is so ambitious in continually taking up new artistic pursuits that his efforts sometimes collide in terms of scheduling. Born and raised inLondon,ON, 54-year-old Max has had open-angle glaucoma since 1989, the unfortunate result of several cataract surgeries he underwent as a teenager in the mid-1970s. At the time, he had 10 percent vision and was considered legally blind. Following the surgery, Max had 20/40 or 20/50 visual acuity, occasionally reaching 20/30, which is his current state. In addition to glaucoma, he has a lazy eye and has had detached retinas three times. Sharing an emotional nugget of self-awareness, Max stated, “The isolation of those years made me more sensitive to creative things and objects of beauty. That is what led me to becoming an artist.” Unlike many in the artistic world, who find it difficult to carve out a living, Max has become a success in his chosen field. His artwork is sold in more than 130 Canadian galleries and is collected in 21 countries around the world. Max is nothing if not eclectic, but most of his interests lie in the artistic realm. After dropping out of fine arts school at Fanshawe College in London,ON, he obtained a degree in journalism, graduating with a BAA (Bachelor of Applied Arts) from the celebrated journalism program at Toronto’s Ryerson University. In the early 1980s, he relocated to Vancouver, where he concentrated on graphic design, founding his own communications firm in 1996. Until 2002, Max was involved with a cornucopia of projects: writing, editing, proofreading, illustration, graphic design, and communications project management. Then he decided to devote himself to painting. Max creates acrylic paintings and archival, original prints (giclees) primarily depicting Vancouver and southwestern British Columbia, as well as botanical images. While his vision impairment doesn’t affect his work, he couldn’t be a wildlife artist, for example, because it requires fine detail. 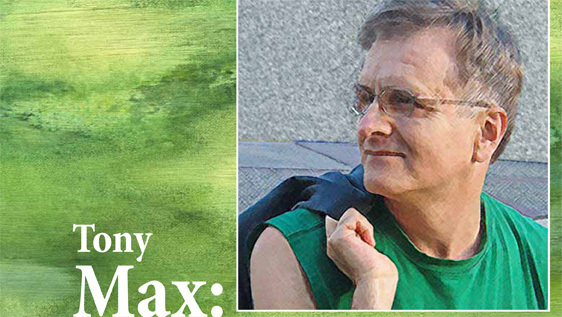 Max’s diverse interests have led him to pursue far-ranging activities such as joining the Editors Association of Canada and volunteering for environmental causes like Sierra Club of Western Canada. His plan for the future is simply to continue what he’s doing. But, in typically ambitious form, he adds that he is interested in digital photography and hopes to find time to get involved in music, as well. “It’s also important to me to support the creative community by educating the public about art and the life of an artist, which I do through my web site,” he explained. The stalwart artist advises other visually impaired people to be very conscientious about taking their medications and going for medical check-ups as required. In addition, he suggests remaining open to complementary medicines, citing glaucoma studies showing that exercise lowers intraocular pressure. He also pointed to a five-year study on vitamin B12 that demonstrated improved visual fields in glaucoma patients. To view Tony Max’s artwork, visit www.tonymax.net.